Like in many countries, “la bûche de Noël”, the Yule Log is the ultimate French Christmas dessert. It’s easy enough to make, you can cover a non-perfect roll with whipped cream, fruits and Xmassy decorations, and it’s tasty, especially if you follow this recipe and make a good filling! Kids will love it!! On this day, the shortest of the year, the Celts would search for a large trunk of either oak, beech, elm or cherry and would burn it. The burning log was a symbol of the rebirth of the sun as well as an offering of thanks to the sun for returning to the earth. This pagan tradition was not snuffed out by the Catholic church and during the middle ages the logs and the ceremony of the burning log became more elaborate. The logs themselves would be decorated with ribbons and greenery. Then the youngest and the oldest member of each family would carry the log to the hearth and set it ablaze. It would burn through the night and the ashes would be collected the next day to be used during the year. They were thought to help cure various illnesses and protect the house from storms, lightening and the evil powers of the Devil. The tradition of actually burning the log began to disappear with the arrival of small stoves and the disappearance of large hearths. The big log was replaced by a smaller branch that was set in the middle of the table and surrounded by little “friandises” (sweets, delicacies) that were given as treats to guests. It is this branch that inspired pastry chefs to create the cake we know as “la Bûche de Noël”. Whether it was a Parisienne or Lyonnaise creation is still the subject of a heated debate! It is first mentioned and described in 1879 and since that time is has become “THE” dessert served at French Christmas dinners. Pronounce la bûche it with a French “u” sound (like tu, not vous) and then a “sh” like shave. “b-u-sh”. You have many Christmas Yule log recipes available, some with flour which makes for an easier “roll”. But I like this flourless recipe which is particularly light and creamy, without being greasy at all. Camille’s note: I found this article of the more or less same cake but with step by step pictures – I think it helps so here is the link. Preheat oven to 400°F. with rack in the center of the oven. Grease the bottom of a 17 x 11-inch jelly roll pan and line with parchment paper. 1. In a saucepan over low heat, melt the chocolate and butter, stirring occasionally. 2. Remove the chocolate from heat and whisk in the egg yolks until blended. Immediately pour into a large bowl. 3. In another grease free, clean bowl, beat the egg whites with the cream of tartar to stiff peaks. 5. Pour the chocolate/egg white mixture into the pan and spread it evenly into the corners with a metal off-set spatula. Bake 10 minutes, or just until the cake has begun to come away from the sides of the pan. 6. While the cake is baking, spread a dishtowel flat and lay a piece of parchment paper, the size of the cake, on top of the towel. Sprinkle the paper with some sugar. 7. Invert the cake onto the paper and carefully peel off the lining paper. Slowly, roll up the cake with the paper inside, and starting from a short side – this is the tricky part of the recipe, so take your time! Wrap the towel around the cake, place on a rack and allow to cool. 1. In a bowl set into a larger bowl of ice and water, whip the cream and Cointreau to stiff peaks. Add confectioner’s sugar to your taste. 1. When the cake is cooled, unroll it. Coat the roll with half of the cream and reroll. 2. Trim the ends and lift the cake to a serving platter. The great thing about this cake is that it doesn’t need to be perfect! You can easily hide the little problems and as far as your filling is good, the cake will taste good! The cake may be made up to one day ahead and stored covered in the refrigerator. Before serving, add some decorations, such as sprigs of holly, or other figurines. 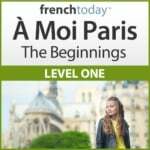 I wish you all to have a great new year with many opportunities to practice your French!